In this month's pediatrician's visit we had been adviced about how to help setting good sleep habits for Tanush. Well, I'll tell you frankly; it feel like a heartless method at times.. But, anyway, we have decided to go with what's been suggested and started on the routine. We keep reconsidering the decision, though.. The first night, he cried a lot!! It was heartbreaking! I couldn't really take it.. I kept reconsidering the decision.. Maybe we can start a bit later... Maybe we shouldn't do it at all! After all, in our homes, it is not done that way... The baby sleeps with his parents!! Our parents are pretty against this exercise.. Actually they just can't imagine that you could do something this hurting to a baby!! And sleep time is the most peaceful time for a baby.. and now, here it is just the opposite! What really hurts most is that Tanush is put to sleep there all by himself, and he cries alone!! And we both sit here outside - we at least have each other for company!! I hate to even take refuge in that company, while he is all alone there!! 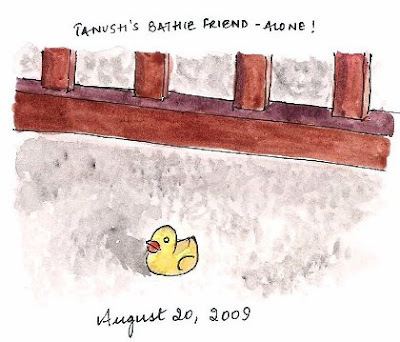 I drew this duckie that was out of place all alone, under Tanush's crib, much like him when he goes to sleep these days.. So many of us have been through this! Glad that the regieme is working out for you all - and that you are still finding time to sketch! Hi Shalini, since you post this, I dare to comment: it will do no good. Such methods transforms human beings into soulless robots, full of unrecognized anger, fears and despair. This is what most people in the west are. Go back to the old, lay off the absurd pediatrician and buy poor Tanush some chocolate with the money you spare. Love is the answer. Nice drawing of the lonely duck.